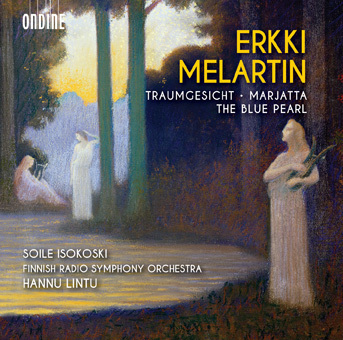 This Ondine release features world prèmiere recordings of three orchestral works by Erkki Melartin (1875–1937), one of the most influential Finnish composers – and symphonists – of the early 20th century. This programme is performed by the Finnish Radio Symphony Orchestra under their chief-conductor Hannu Lintu. Traumgesicht is an Impressionistic large-scale symphonic poem written for Alexander Siloti in 1910. In later years Melartin considered it as one of his most important works. Traumgesicht differs from the National Romantic image generally associated with Melartin. It could be described as progressive: the composer was obviously up to date with recent trends, since influences from composers such as Richard Strauss, Debussy, Rimsky-Korsakov and Scriabin may be detected.The work lied unperformed for 81 years until Hannu Lintu brought it back to light by conducting it in Helsinki in 2013. Marjatta (1914), A Legend from Kalevala, is based on the Finnish national epic and bears hints to Sibelius’ Luonnotar and Melartin’s Aino opera. Both Sibelius’ Luonnotar and Melartin’s Marjatta were written for the same singer, Aino Ackté, in mind. Luonnotar and Marjatta can with good reason be regarded as parallel works or siblings, even though they are very dissimilar in musical style. The solo part of the work is here sung by the celebrated soprano Soile Isokoski. Music for the ballet The Blue Pearl, completed in 1930, was one of the last major works written by Melartin and, surprisingly, the first full-length ballet written in Finland. Although the ballet music was popular in its own time the work gradually fell into oblivion. Conductor Hannu Lintu has adapted the music of the ballet into a 8-movement concert suite.